Preparing a home for sale is one of the most important aspects of the listing process. In fact, there are several simple repairs you can make that will help your home show better and sell faster without spending a lot of money or taking up too much time. One of the smartest investments you can make is careful preparation of your home for sale. Just as one would detail a car for sale, one must also prepare a home. The right touches can add dollars to the final sales price and speed up the time it takes to find a buyer. Let’s take a look at a few of them. The first and most obvious is fresh paint. A new coat of paint can go a long way toward adding beauty and character to any home. Take inventory of each room: how long has it been since the room was painted? Is the color of the room pleasing to the eye and relaxing? Consider using basic neutral colors throughout the interior of the home to achieve a spacious look and feel. 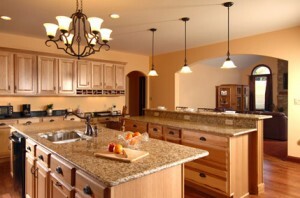 Neutral tones convey to a potential buyer an impression of cleanliness and flexibility for use in any way they choose. If the exterior of your home has not been painted in several years and now appears faded and weather worn, this is the time to repaint. Don’t forget fencing, gates, patio covers or garage doors either. Make sure the kitchen is in perfect condition and up-to-date. Besides being immaculate, which is essential, do all the electrical outlets have faceplates around them? Are all light switches similarly covered? Look for any bare wires, hanging wires or other electrical issues that might indicate unsafe conditions. Now is the time to make small upgrades to your kitchen if you can afford to do so. A new stove, a new dishwasher, or other new and modern appliances may be all you need to give a kitchen a quick remodel. If your sinks are chipped or broken, replace them. Make sure faucets in the kitchens and bathrooms are all working and in good repair. Plumbing and electrical issues are red flags, so pay close attention to both. You want your home to appear as clean, safe and modern as you possibly can. This applies to both the inside and outside of your property. Change lightbulbs or use soft, low wattage lighting that flatters a room: remove clutter throughout the house, yard and garage. Make sure closets are not overstuffed or in a disorganized state. Sometimes the best investment you can make is in a good handyman and cleaning service to advise and assist you. Make sure carpets are spotless and in good repair. Replace any broken tiles, scuffed sections of linoleum, broken glass or windows, missing handles or openers on cabinets and drawers, venetian blinds or window shades and make sure mirrors are gleaming. Thorough cleaning and a few minor repairs will go a long way toward creating that all-important first impression. Pay attention to detail, make a few small but important repairs and watch it pay off!